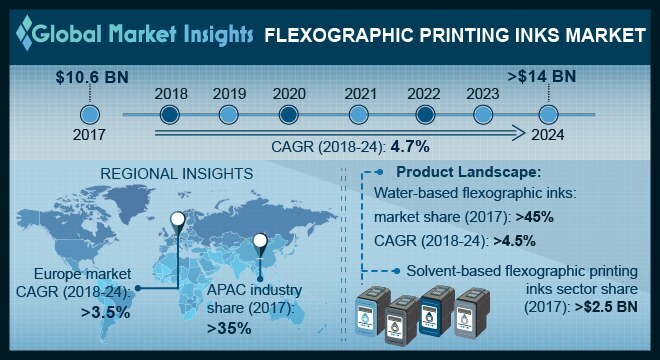 Flexographic Printing Inks Market is poised to surpass USD 14 billion by 2024; according to a new research report by Global Market Insights, Inc.
Strong product demand in the flexible packaging industry will drive the flexographic printing inks market size in the forecast period. The flexographic printing inks has its extensive application in the packaging of products in food & beverage and cosmetics industry. The rise in the numbers of e-commerce websites has amplified the package printing opportunities. For instance, a survey from Pack Expo shows that 34% of the customers who buys from e-commerce websites tends to return their package if they don’t like the packaging. This aforementioned situation creates new opportunities for the packaging market which will positively influence the flexographic printing inks market size by 2024. The product does not carry any volatile organic compound (VOC). In addition, the product offers value added characteristics such as gloss and color consistency due to its high viscosity. Solvent-based flexographic printing inks are strictly governed by standards laid by FDA owing to its VOC constituents, as these inks come in direct contact with food. Additionally, these inks also release VOC during the dying process, which makes the product harmful for the environment and may act as a barrier in the growth of the flexographic inks market size. However, growing popularity of UV-cured flexographic printing inks market is another promising factor which will contribute the industry growth in the near future. It involves a high intensity UV radiation for inks drying process. This efficiently offers quick drying and thus improves the printing rate resulting in driving the flexographic printing inks market size by 2024. Based on products, water-based inks are projected to grow at a CAGR over 4.5% by 2024. These inks are majorly used in the paper, cardboard and newspaper printing. Increasing government initiative along with rising consumer awareness towards use of low VOC inks in the food and cosmetic packaging applications will substantially boost the industry size in the near future. Solvent-based inks accounted for more than 25% of the total flexographic printing inks market share in the forecast period. The product offers promising characteristics such as durability, high printing rate (due to speedy drying) and scratch resistance. However, firm consumer and environment safety regulations directed by the FDA may obstruct industry growth in the coming years. However, manufacturing of innovative products and ever-growing opportunities from packaging industries will augment the flexographic inks market size by 2024. Packaging applications registered for over 28% of the global flexographic inks market size by 2024. Strong growth in the food & beverage, cosmetic and pharmaceutical industry along with increasing packaging demand in these industries will boost the industry growth in the forecast timeframe. Moreover, additional features such as aroma preservation, sealing, moisture resistance and appealing esthetics are positively influencing the flexographic printing inks market size in the projected timeframe. Asia Pacific flexographic printing inks market size was over USD 3 billion in 2017 in the forecast period. Sturdy growth in the food & beverage, pharmaceutical and cosmetic industry, particularly due to improved consumer lifestyles is the major factor contributing industry growth in the region. Furthermore, drifting pharmaceutical manufacturers focus towards establishing their manufacturing facilities in China due to high medicine demand, low initial investment and favoring government norms towards boosting their manufacturing sector will substantially boost the regional flexographic printing inks market size by 2024. The industry share was fragmented with some key market share contributors i.e. TOYO Ink, INX International, Zeller+Gmelin, XSYS Print Solutions, Zhongshan DIC Colour, Flint Group, Sun Chemical, ALTANA AG, Wikoff Color, TOKA, RUCO, Tercel Ink, Jiangmen Toyo and Taiyuan Coates are some of the prominent industry share contributors.